These are a few of my favorite things!” I love that song…….girls in white dresses with blue satin sashes, snowflakes that stay on my nose and eyelashes. Yeah, you’re gonna sing that all day now. I’m not sorry. I decided that since it was the Christmas season, I’d talk about my current five favorite things in the kitchen. I’ll also tell you how you can get them cheaper than retail. Yeah, you knew that was coming. If you know someone who loves kitchen things and you can’t think of what to get them for Christmas, then today you’re going to get five options to choose from. Your shopping just can’t really get any easier than this. I should go into business being a personal bargain shopper. This is the most expensive of my five things……unless you run into one at a yard sale. I got one this summer for my friend Kim for a grand total of $1.00. Yep. Don’t be a hater. Anyway, I am in love with my food processor. I use it a LOT. 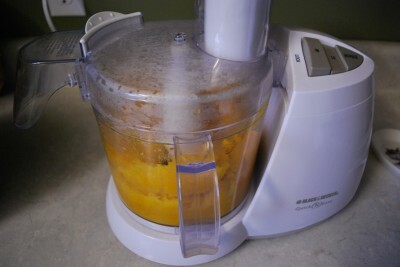 It will puree soup….okay, it purees whatever you put in there, but I just wanted to say soup. It does a ton of other stuff too, but I didn’t read the manual. I’ve got a weird relationship with instruction manuals……I don’t read them. I just really enjoy mine. It makes a lot of the things I do in the kitchen a lot quicker. Sometimes if I have a lot of veggies to chop, I’ll just throw them in there and give it a whirl for a few seconds. Done! It can also be used to make pie crust, but we’ll explore that later. So, how do you get this baby cheaper? Mine was a gift from my Mama. Thanks Mama! That’s a good way to get it cheaper. Of course, I already said you could look for them at yard sales. However, if you want one NOW you’re in luck. ‘Tis the season! This time of year tons of electronic things are on sale. This is really the time of year to buy anything electronic. I just saw today that they have tons of options on Overstock.com and they are also offering $1 shipping! 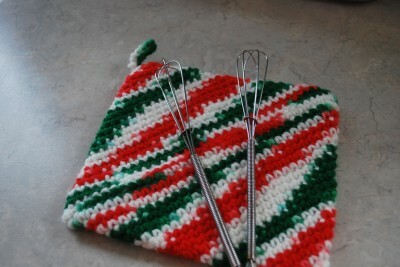 I <3 my mini whisks! They are really great for making flour pastes or anything else that you’re making in small quantities. I use them a lot to make confectioner’s sugar icing. Regular sized whisks are too big to get down into the crevices of bowls, so you end up having globs of stuff that didn’t get mixed up. Bummer. They’re awesome for making brown gravy! I love brown gravy…….I can just drink it straight out of the pan. Don’t be a hater. Every cook should have a mini whisk. If you don’t have one, you’re really deprived. It would make your life so much easier! Ok, so you’re not really deprived….but they are really nice to have. I found mine at a specialty cooking store for $.99. So, even if you HAVE to pay retail, it’s not going to be much. I checked eBay and Amazon and saw several for under $5 in packs of two. They would make a great stocking stuffer! See these? 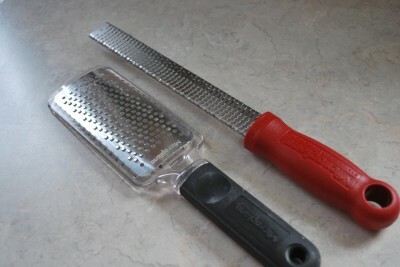 They are Microplane Graters. That sound you hear is the chorus of angels as they sing “Glory!” Honey, honey, honey. These are AWESOME!!!!!! If you’ve ever tried to zest anything using a regular grater, then bless your heart. 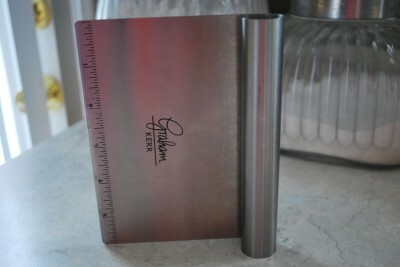 I used to try to zest things using my regular one…..and it made me want to cuss. Seriously. It was terrible. I didn’t even use zest because of that……and man was I missing out. Zest makes things taste so…….tasty! It just gives food a little BANG! But, these are used for other things too. You can grate anything with them that you’d want to be very little. I use mine to grate cheese sometimes. Heck, I even use mine to grate my soap when I’m making homemade detergent. They are not a necessity, but I really love mine. I bought both of mine at Bed, Bath, and Beyond. So, you want to get it cheaper? Here’s how – sign up to get the mailings from Bed, Bath and Beyond. When you get your first email, you’ll get a coupon for 20% off your purchase. Then you will start getting the circulars in your real mail box. Those include a $5 off $25 coupon or a 20% off coupon. Yay! I love savings! Also, someone who used to work for that store told me that these coupons never run out. It’s a Christmas miracle! Meet my bench scraper. This is near and dear to my heart any time I am making bread. It’s great for dividing dough nice and cleanly. When I’m done, it’s also great for scraping all the leftover dough and flour from my kneading board. I also turn it on its side and use it to smooth the sides of cakes when I’m decorating. I love that it has a nice round handle that hangs on the side of my dish drainer after I wash it. It’s just nice and handy to have. It will also chop veggies and it’s great for scooping them up to plop in the pan when you’re done. These are also sold at Bed, Bath, and Beyond so you can get the same discount that I mentioned above. I did see them on Amazon as well for around $4. I love this one so much that I bought one for my Mama too. She’s not as big of a fan as me……..but I know why. It’s not because she doesn’t use it. It’s because I gave it to her and now she put it away and doesn’t get it out……I think secretly she lost it. Sometime I think I’ll go through the cabinets, find it, and bring it home to live with me. She’ll never miss it. 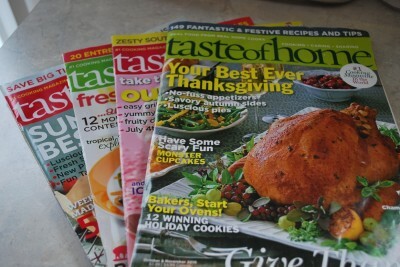 If you’ve been around here for long, you know I’m a fan of Taste of Home magazine. I’ve been a subscriber since Barry and I got married. His aunt gets it for me every year for Christmas. I have kept every single issue. Every. Single. One. Sometimes for fun I get them out and look through them…..I lead a very exciting life. I use them all the time. I love that they have great recipes with normal ingredients. I hate those stupid gourmet magazines that call for ingredients that no one has ever heard of. And seriously, who is going to eat a whole fish with the eyes still in it? Not me. I don’t want anything looking at me while I’m eating it. CREEPY! Bouillabaisse? Um, no. There are shells in there. That doesn’t even look right. Just give me a nice recipe for ground beef, thanks. Right now you can get two years for $20….that’s a pretty good deal. I saw it cheaper a few months ago, but that offer isn’t available. 🙁 Sad. Most gift subscriptions are $10 every year. They are totally worth $10. You will love it…….you can buy it for yourself. You don’t have to wait for a gift. Get a gift for yourself! I do that all the time. I say, “I’m getting this for Yadda Yadda.” Then, I get home and it’s totally mine. Why do I do that? I have good intentions……..I’ve had good intentions this year Santa. Please bring me a Le Creuset dutch oven. Thank you. Hi Stacy, I’m having a ball reading different posts tonight–I love the way you write. 🙂 In this post, you mentioned a kneading board. Could you elaborate on that, please? I just gave away a large (maple, I think) cutting board that I bought at Ikea (in Beijing!) years ago because I never used it, though I had originally purchased it to knead bread on. I could never figure out if I should oil it, flour it, or what for that purpose. If I understood how to prep one and care for it, I might get another (though not from Ikea because theirs are bamboo now, I think). Hmm, I wonder if a piece of pine from Home Depot would work??? 🙂 Thank you!